PS the customer is currently seriously considering migrating their BoT to BoH in 2013..
F For BW-on-Exadata the foundational advice would be similar to the one for BW-on-TD. If 99% of the planet is going on one path don't try to reinvent another one on your own. There is inherent safety in numbers. Radio VOE has validated that the strategic advantage of following the herd far outweighs the adventurist assumptions & costs of being a loner, ie. Having the rare honor out being the 1:5000 implementations on a unique track does carry its own risks and disadvantages. The key decision is not only about tactical cost but about strategic Business Value. Keep this as your 'center-of-the-universe' decision factor of your final decision. 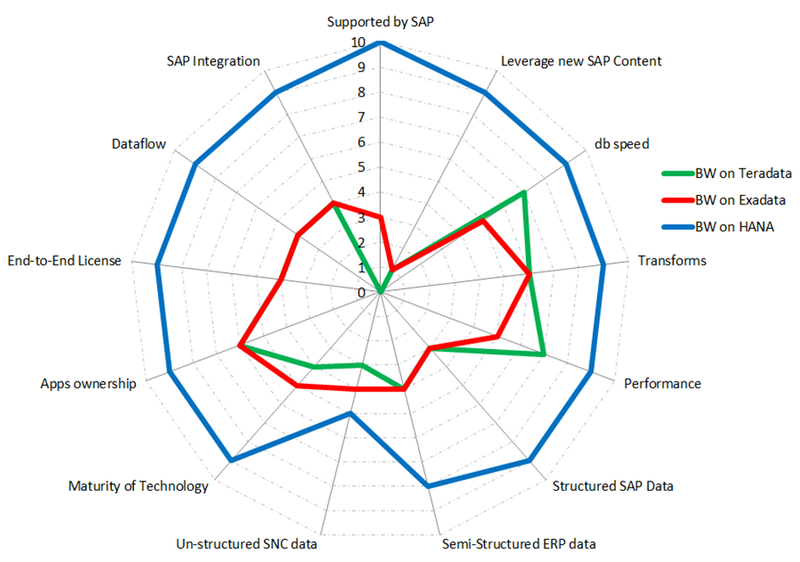 HANA has no apparent competition for SAP customers. Monopoly in HW development, support and services. No competitive forces encouraged. Disc to server and back. Hi Hari, I find very interesting part about Teradata. Actually I was not aware that BW can run on Teradata. Thans for sharing!